I received a copy of this book from Harper Voyager Australia in exchange for an honest review. 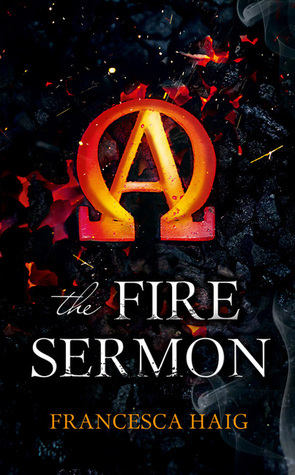 I loved the concept of The Fire Sermon, the book certainly showed a lot of promise in the first chapters. Towards the middle, I felt that the plot dragged a bit. Thankfully, it resurges at the end to finish on a strong note. There was always one boy and one girl, with one from each pair perfect. Not just well-formed but strong, robust. But soon the fatal symmetry became evident’ the price to be paid for each perfect baby was its twin. They came in many different forms: limbs missing, or atrophied, or occasionally multiplied. Absent eyes, extra eyes, or eyes sealed shut. These were the Omegas, the shadow counterparts to the Alphas. The young adult genre is littered with farfetched post apocalyptic set-ups: ranging wildly from worlds where love are outlawed, to planets where all your thoughts are vocalised in an endless stream of noise (an aside: I LOVE THE CHAOS WALKING TRILOGY). 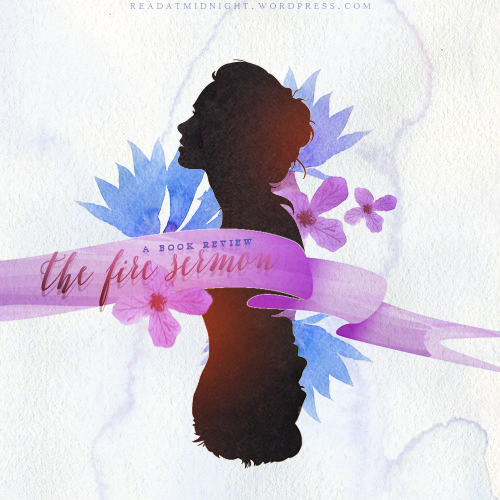 Hence, when I found The Fire Sermon is based on the concept of twins and their dichotomy: with one being mutated, the other flawless – I took it all in stride. The Fire Sermon can be an upsetting read, as the world it’s set in is definitely dictated by ableism. As parents on Omega children are lawfully required to abandon them, sequestering them into isolated, starving colonies – the book allows its plot to explore the marginalisation of the disabled. More than this, the Omega are infertile, derogatorily called dead-end and forced to believe that they have no future as a people. I love The Fire Sermon for being able to examine some of their struggles. However, I wished that our main character did not come from a position of relative privilege. Though Cass is an Omega, she was able to hide this for most of her childhood as she had no physical deformities. Instead, her curse is being a Seer – with the ability to sense danger, directions, and glimpsing at the occasional prophetic dream. She’s stuck in-between, the Omega envies her while the Alphas fear her. She’s in a fairly awful situation, but the Omegas are correct to say that she has it easier than the rest of them, to be frank. Thw twins came in pairs, and they died in pairs. Wherever they were, and no matter how far apart, whenever someone died, their twin died too. I also loved the way the twins are intricately linked. The Alphas are taught to hate, while the Omega are taught to fear their twin – however, when one die, the other will follow. For this reason, the Omega are not completely cast off by society – they are a required an unwanted part of this world. Seeing all the various twins and their tumultuous relationships in this book was very intriguing. My favourite relationship in this book was the one between Cass and her brother, Zach. Zach is spiteful, he feels that Cass owes him his childhood as she hid her Omega trait – making the Alpha suspect and shun them both. He’s also ambitious and ruthless, ready to climb up the ranks of society and cast off Omega once and for all. However, both Cass and the reader feel that he still yearns to spare his sister: whether it’s from love or from a selfish sense of preservation; it’s hard to tell. But that’s what makes this relationship so damn interesting! The first 200 pages of this book was freaking amazing, I loved the way it set up the plot, the world, and the relationships that Cass has. And then Cass goes on the run, while the plot ran off with her? I felt that for about 150 pages, nothing much really happens. Also, Cass’s relationship with a boy she finds, named Kip, induces me to sleep a little. I think there was meant to be a romance somewhere in there, but they sadly had zero chemistry. Cass has more spark with her own brother… did I just say that out loud? Anyway, that’s totally not just my brain wired up from twincest thanks to GoT and Falling Kingdoms, hee! Despite the slight hiccup I had with the middle part of the book, I found the writing lovely – and I love the questions the book pose for potential existence between both Alpha and Omega. There’s also a brewing resistance (when isn’t there! ), so I’m excited to see where that plotline will go. The twist at the end of the book wasn’t entirely unexpected, but it definitely throws the plot in a completely different directions than what I expect – so I’m eager to check out the rest of the series. I loved this spin on the dystopia world, which provides us with sibling angst and confront us with the issue with ableism. It’s a book that makes me think and contemplate, and you know how I love those! Have you read it? What are your thoughts? Next ›Discussion: Are You Review Ratings Objective or Subjective? The characters were pretty garbage for me overall though; especially the whole Cass-having-powers-that-can-be-summoned-during-moments-when-she-needs-it-only. The writing/setting is really what saved the disaster of the plotting (considering I’d rank this first installment higher than Red Queen). I too felt that after 30% it went downhill but her writing made her environment into a character; that much was appreciated. Cass’s power was 100% total hack lmao. I enjoyed the setting enough to continue though! It’s actually marketed as adult fiction here in oz. But a lot of fantasy seems to be e.g An Ember In The Ashes, Steelheart etc all hides out in the adult range. I guess they just do what they think sell better haha. Yay glad you also enjoyed the sibling relationship, Mari! I thought the twins were really well done. I was glad to see Piper and Zoe friendly as well. Hmm… That’s certainly a pretty cover, but I’m a little bit over the post-apocalyptic genre unless it’s from a favorite author. It’s a shame about the dragging middle section and the boring romance. I am intrigued by the twins dynamics though. It sounds interestingly morbid! If I was going to rec a post-apocalyptic type- I would say Red Rising and The Girl With All The Gifts before this one. Just wait til the next batch of review comes out for the 2nd book before you commit if you’re not sure you like it!! Hmm, interesting. This sounds pretty decent. 3.5 for YA is typically my rating too for “not bad and nothing special — but I’m still intrigued.” I’ve seen and heard a lot about this one around, so maybe I’ll wait until seeing reviews of the next one to decide if I want to pick up this series. The premise was really good but the middle part had me looking wistfully at my page number every couple of paragraph- which is not a good sign haha! Waiting for the next group of reviews is a great idea! Yay another Chaos Walking fan! Todd and Viola and Manchee has my heart forever! If the concept of The Fire Sermon sounds interesting to you- you should def check it out. The good outweighs the negatives here!! The twin concept is quite well done! Hope you enjoy it if you decide to pick it up! I neeeed to read the Chaos Walking series. I feel like I’m the only person who has not read it. Other than that, great review! This sounds intriguing. Ohh that series is the best! It has phenomenal characters and conflict – and always super intense and engaging! I highly recommend it. The writing style might throw you off at first but trust me it’s worth it!! I think the concept of twins were really well done here. So if you’re interested I would give this book a shot! THANKS ALYSSA!! My primary reservation was with how slow the middle chapters were. But otherwise, the book was great- so if it’s been rec to you by trusted sources I would def check it out! Sounds like an interesting book, but not something I see myself reading. I’m not that big on mutation or body mutilation. But yay you got an ARC! You go girl! Fair enough! I can see that the book isn’t for everyone. The mutations made me a bit squeamish tbh. Hehe thanks you! This book has actually been out for a little while though XD Australia is not a land abundant of ARCs– we more often get finished copies a bit early I believe. Hey that’s still pretty awesome! At least you don’t have to buy the finished copy like you would if you really liked the ARC!